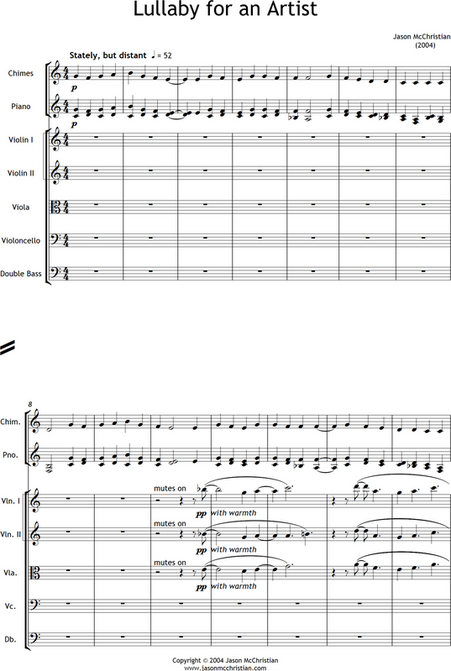 Cast in a single-part form, Lullaby for an Artist is made up of two melodic lines, which are similar in structure and contour. Through the use of two different modes (C + G Mixolydian), and portamenti, occasional dissonances occur between the lines when played simultaneously. The lullaby is not so much about sleeping, but rather about dreams and passions, while the artist represents the members of our society who are unfortunately forgotten at times when we most need their insight.